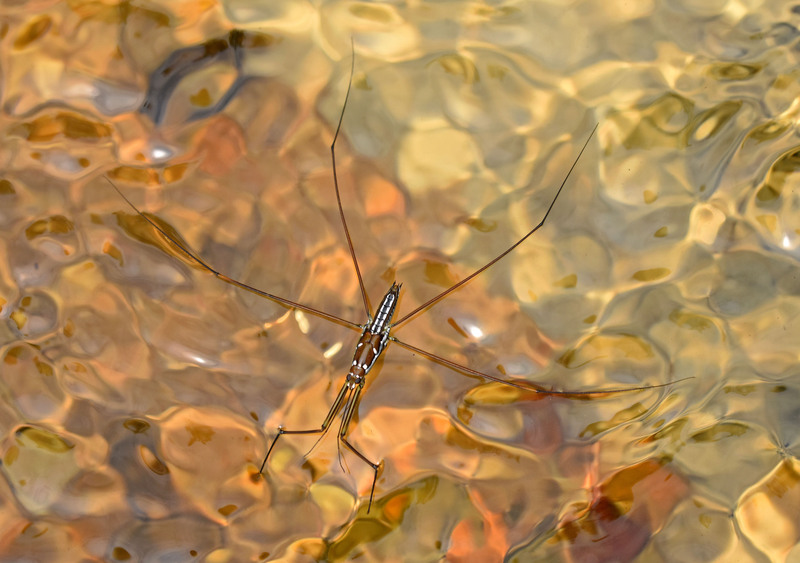 Water striders are not the easiest insects to photograph; they zip about on the surface of the water so a fast shutter speed is required. If you try hard enough, soon enough you get lucky and some of the images are in focus! I came across these insects on a small, fast flowing stream near a popular waterfall site in Chiang Mai, at the foot of the mountain (Doi Sutep) which rises above the city. I am no expert on these insects, but with a little research and Googling, I think they are Ptilomera tigrina. They do not have a common name, but ‘ptilo’ means soft or feather-like and Tigrana is a girl’s name. Ptilomera tigrina is a common widespread species in South East Asia (1). They typically occur in riffles of fast flowing streams where they maintain their position by rapid striding in an upstream direction. They skate along on the surface of the water, sometimes hanging on to rocks in the stream, but jumping back onto the water surface it threatened. The water surface is their home but they have been seen hanging onto the rock face behind a waterfall, at the waterline (1). 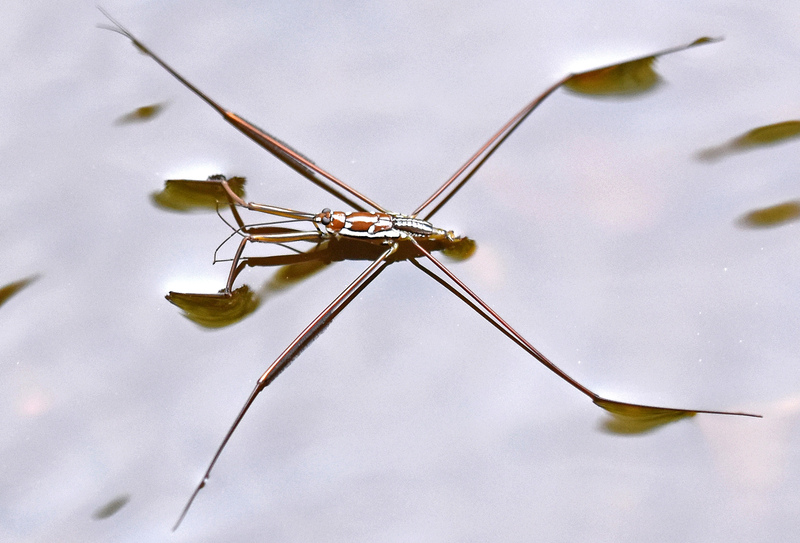 Water striders can stand on the water and even jump off the surface, because of their low body mass and super-hydrophobic (i.e. non-wettable) legs (2). Their legs and ‘feet’ (tarsi) are covered in large numbers of tiny hairs called micro-setae – with special microscopic grooves – which allow them to use the surface-tension of the water to stay afloat (3). Amazingly they are able to ‘survive on water even if they are being bombarded by raindrops, when they bounce to avoid being drowned’ (3). The males and females are quite easy to tell apart. The females are slightly larger, with more white along the sides of the abdomen and with more pointed terminal abdominal segments. The mating behaviour is interesting: the males are described as being quite undiscriminating, jumping on the back of any individual – male or female – at the back of the group. According to the zoologist – Professor Michelle Tseng – who studied this behaviour in a related species (Ptilomera hylactor), there then follows a vigorous struggle with ‘flips and somersaults’ between the pair on the water surface (4). If unsuccessful, the male moves on to another individual, continuing until achieving a successful mating. It seems to be a rather hit and miss affair! But clearly it works as there is no shortage of these bugs. Fig. 5 from Jehamalar et al. (2018). Review of Ptilomera (Ptilomera)(Hemiptera: Heteroptera: Gerridae) from India, with description of a new species. Zootaxa, 4370(5), 501-518. A = male; B = female. 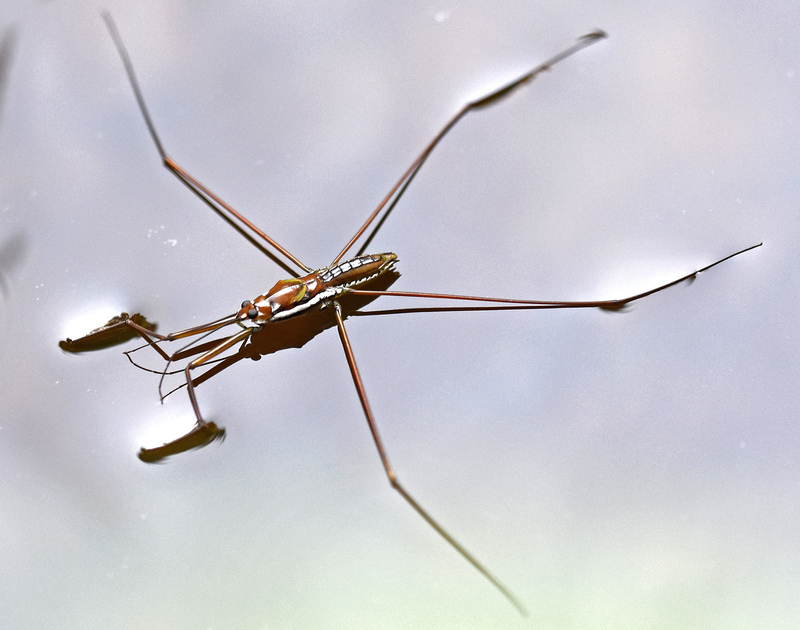 Some of these aquatic insects have a very nasty bite, as one researcher who recently co-discovered three new species of Ptilomera water strides from Thailand, discovered. Although it is not clear from the article, exactly which species he was referring it to, they clearly deserve respect! 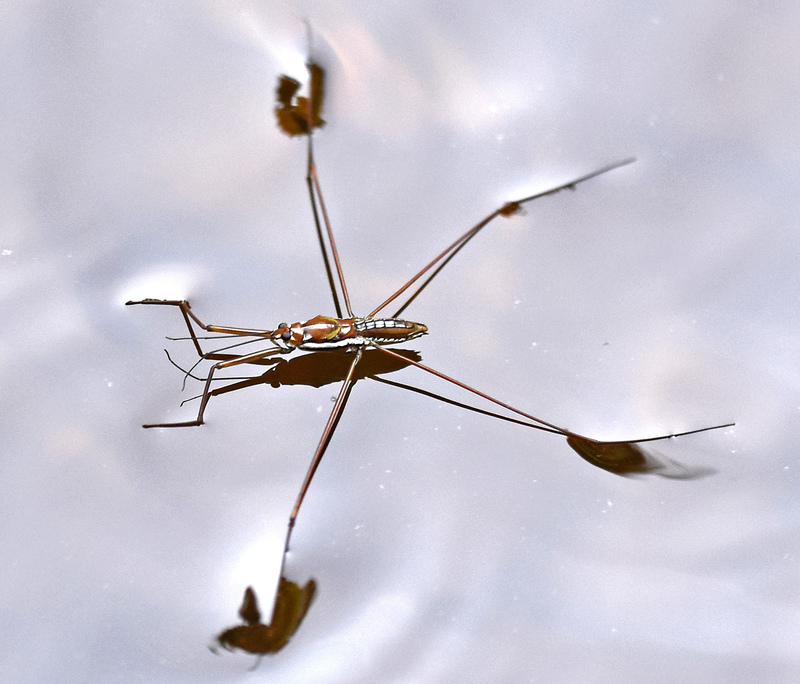 There is still a lot more to find out about water striders and new species are still being found (5). Some of these images were taken at Huai Keaw waterfall, Huen Huay Keaw, at the foot of Doi Sutep mountain, Chiang Mai, Thailand. Others were taken at Monthathan waterfalls further up the mountain in Doi Sutep-Pui NP. Raruanysong, S., Vitheepradit, A., & Sites, R. W. (2014). Key to the species of Ptilomerinae (Hemiptera: Heteroptera: Gerridae) of Thailand and review of the fauna of the Tennaserim Mountain Range. Zootaxa, 3852(1), 101-117. Koh, J. S., Yang, E., Jung, G. P., Jung, S. P., Son, J. H., Lee, S. I., … & Cho, K. J. (2015). 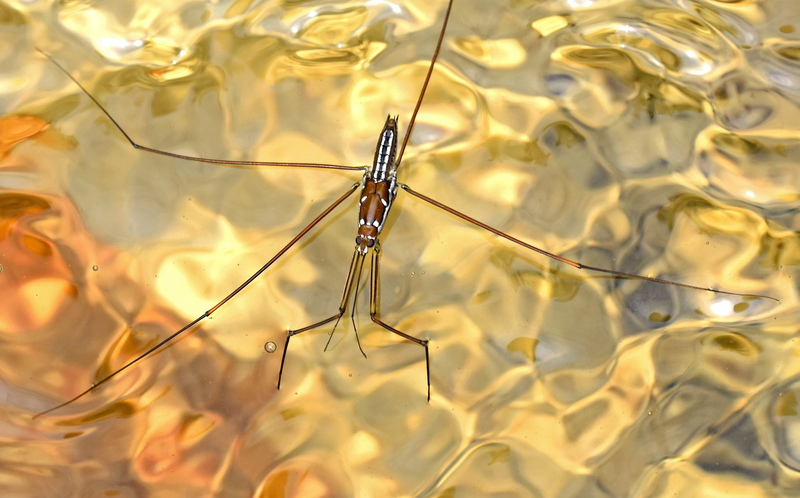 Jumping on water: Surface tension–dominated jumping of water striders and robotic insects. Science, 349(6247), 517-521. Gao, X., & Jiang, L. (2004). 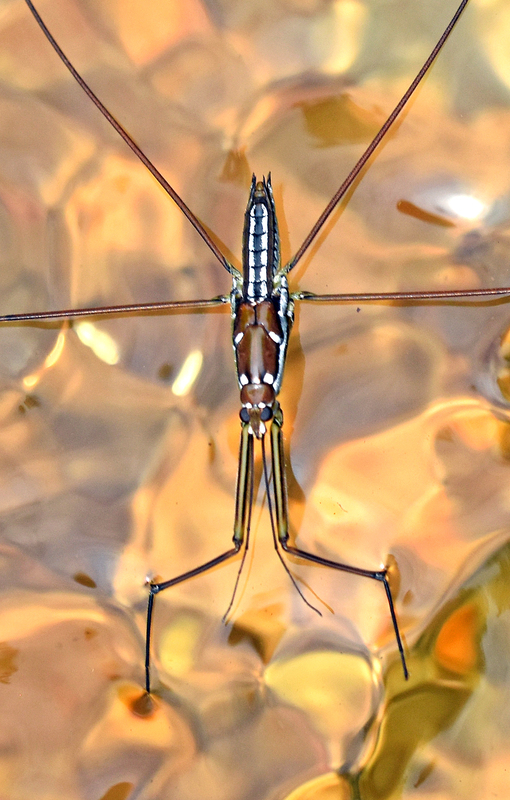 Biophysics: water-repellent legs of water striders. Nature, 432(7013), 36. Tseng, M. (1999). Notes on mating behavior and sexual size dimorphism of two species of water striders (Hemiptera: Gerridae) in Vietnam. Journal of the Kansas Entomological Society, 327-329. Vitheepradit, A., & Sites, R. W. (2007). 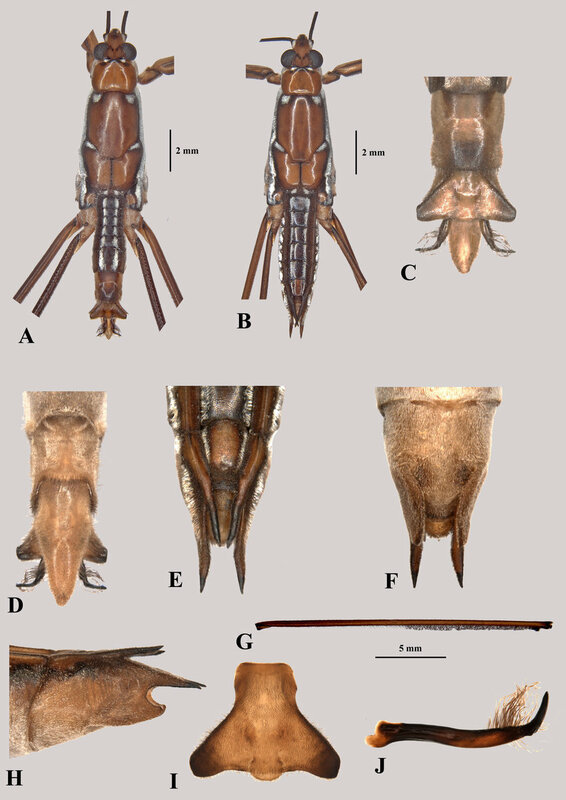 A review of Ptilomera (Heteroptera: Gerridae) in Thailand, with descriptions of three new species. Annals of the Entomological Society of America, 100(2), 139-151. Jehamalar, E. E., Chandra, K., Basu, S., & Selvakumar, C. (2018). Review of Ptilomera (Ptilomera)(Hemiptera: Heteroptera: Gerridae) from India, with description of a new species. Zootaxa, 4370(5), 501-518.